As the third and final installment of SITE Santa Fe’s “New Perspectives on Art of the Americas” biennial series, Casa tomada evokes a multivocal power play between three key relationships: permanence/impermanence, receiving/rebuilding, and within/beyond. These tension nodes create the discordant yet unifying structure that forges connections between the divergent works by the biennial’s 23 artists. Curated by José Luis Blondet, Candice Hopkins (Carcross/Tagish First Nation), and Ruba Katrib, with Naomi Beckwith as curatorial advisor, Casa tomada, or house taken over, reveals a well lived-in house to audiences—a home heroically co-authored and staged by the participating artists that enacts oblique allusions to the exhibition’s name. In addition to the translation above, Blondet shared that the title could be understood as “house under the influence,” or “drunk” house, as well as a militaristic connotation of “house under siege.”1 These descriptions apply to the undulating and purposefully uneven sensibility of the exhibition’s content, layout, and design. Named after Argentinian author Julio Cortázar’s 1946 fictional narrative that metaphorically recalled the era’s national politics, Casa tomada hinges on the specificities of rhetoric, as Hopkins explained during an exhibition walk-through.2 She recognized Beckwith’s keen guidance in the co-curatorial process of situating language as the foundational guidepost for artwork selections. As such, the biennial’s artworks become touchstones3—a word that Katrib used to describe Casa tomada’s curatorial methodology—as beacons between layered pathways of meaning that strategically embody the exhibition space. Through this style of curation, an exchange of stories overlaps, spirals, and twists through and between the two- and three-dimensional and time-based objects on view. This dialogue increases in complexity as visitors infuse their own layers of experience, intertwining their knowledge with that presented to them by the artists and curators in visual form. Themes including varied histories of the Americas, ecologies of being, institutional forces, and temporalities of home maintain a strong level of unresolvedness throughout Casa tomada. Selected for one of the ten commissions for the biennial, Eric-Paul Riege, a Diné (Navajo) artist from Gallup, New Mexico, constructed a site-specific environment entitled diyin+, hooghan and weaving dance (fig. 3) for Na’ashjéíí Asdzáá, Retha, Effie, and Angela (2018). This artwork—honoring the birth of weaving as given by Diné holy being Spiderwoman to the Diné people—features photographic prints, two regalia ensembles, and a male Diné house (hooghan) made of wool looms.6 It was presented in tandem with a three-hour duration performance presented to audiences on August 3 as part of the Casa tomada opening events. Inscribing a record of his movement, Riege wore both regalia sets, walked throughout the interior and exterior of SITE Santa Fe, and re-enacted the building of the wool house’s walls. Meshing contemporary art concepts with Indigenous worldviews, Riege’s installation and performance pay tribute to Spiderwoman and her legacy of weaving—a sustaining practice reliant upon intergenerational teaching. Presenting works that comment on familial life as impacted by institutional constraints, Sable Elyse Smith, a New York City-based artist, contributed a video entitled Men Who Swallow Themselves in Mirrors (2017) and Landscape IV (2018), a light sculpture commissioned by SITE Santa Fe. The video samples from Al Green’s 1972 song, “Love and Happiness,” and it juxtaposes footage of Smith’s imprisoned father performing everyday activities for the camera with clips of scenes from the outside world and pop culture sources.7 The video emphasizes the pistol as an action figure—simultaneously positioned as both protagonist and antagonist. The choppiness of this montage contrasts the retail window aesthetic of Smith’s neon wall work. 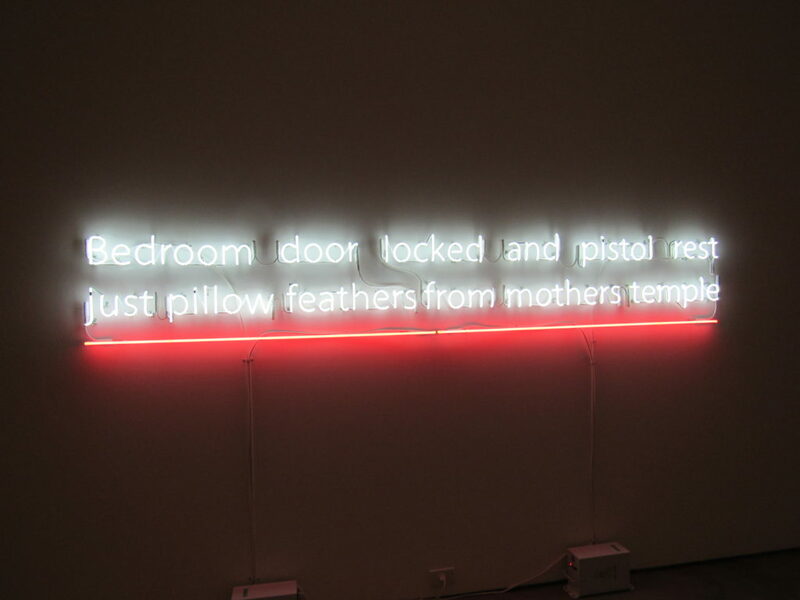 This sculpture reads, “Bedroom door locked and pistol rest just pillow feathers from mothers temple.” With its white letters underlined in red, the colors express both innocence and blood, gesturing a sense of fragility and fleetingness while also being a blatant advertisement that leads one into the screening theater—a viewing cell. Smith’s phrase is not a grammatical sentence, and it contains incorrect case agreement and possessive denotation that coyly confront the politics of a father being incarcerated and a sanctuary in the hands of a mother. Here, Smith’s subversion of writing mechanics provides an open-ended conclusion to her father’s future and implications of his relations with his own pistol—the weapon at center stage of this installation. Portrayals of specific temporalities of home metaphorically stipple an intersecting map of relations throughout Casa tomada, exuding an atmosphere of dissonance and collectivity. As well, the biennial’s ethos depends on its aesthetics of precariousness and changeability. However, the materiality of the artworks often signals permanence as a key underpinning of the exhibition. The curators clearly conveyed this theme by including a micaceous clay cast of the severed right foot of a bronze statue of Juan de Oñate (founder of Santa Fe) erected as a monument in 1993 in Alcalde, New Mexico—northwest of Santa Fe and adjacent to Ohkay Owingeh, an Indigenous pueblo.8 In 1599, the next year after Spanish conquistador Oñate seized the lands of present-day New Mexico, he imparted further damage (beyond many deaths) to Indigenous families by requiring 20-year enslavement terms of Acoma Pueblo women over 12 and men between 12 and 25, with the right feet of 24 Acoma male warriors removed—determinations for the Spanish court’s exile of Oñate to Spain.9 By displaying the statue’s right foot cast in local micaceous clay, Blondet, Hopkins, Katrib, and Beckwith commemorate the Friends of Acoma group’s 1997 alteration of the statue—a centerpiece of the Oñate Monument and Resource Visitors Center (now the Northern Rio Grande National Heritage Center).10 An Indigenized record of Native resilience, the clay foot evidences the Western hemisphere as the time immemorial home—or permanent house—of Indigenous peoples. Casa tomada is on view through January 6, 2019 at SITE Santa Fe in New Mexico. 1 Press Preview, SITE Santa Fe, August 2, 2018. 4 José Luis Blondet, “Locked Out (Ghosts and Orthopedics),” in Casa tomada, ed. Lucy Flint (Santa Fe: SITE Santa Fe, 2018). 5 Press Release, SITE Santa Fe, July 27, 2018. 6 Candice Hopkins, “You Might Say That The Masters Never Saw It Coming,” in Casa tomada, ed. Lucy Flint (Santa Fe: SITE Santa Fe, 2018). 7 Ruba Katrib, “Displacements,” in Casa tomada, ed. Lucy Flint (Santa Fe: SITE Santa Fe, 2018). 8 Naomi Beckwith, “If Thy Right Eye Offended Thee,” in Casa tomada, ed. Lucy Flint (Santa Fe: SITE Santa Fe, 2018). Reynaldo “Sonny” Rivera created the statue. After its alteration by Friends of Acoma, Rivera made a cast of the left foot to replace the missing right foot. For more information, see Lucy Flint, ed., Casa tomada (Santa Fe: SITE Santa Fe, 2018). 9 Matthew J. Martinez (Ohkay Owingeh), “Remembering 400 Years of Exile,” Green Fire Times, August 2, 2014, https://greenfiretimes.com/2014/08/remembering-400-years-of-exile/; University of California-Berkeley, “Don Juan de Oñate,” https://www.ocf.berkeley.edu/~celina/onate.html. 10 For more information, see http://www.rio-arriba.org/departments_and_divisions/onate_center.html and http://riograndenha.org/What_We_Do/Who_We_Are/index.html. October 22, 2018 | Filed under Art Seen: National and tagged with casa tomada, Julio Cortázar, Michelle Lanteri, SITE Santa Fe.